After the first nine plagues, is the tenth plague free? A missing archeologist reappears out of the desert in a semi-mummified state. With him he brings a biblical disease that threatens to yadda yadda the world. A brilliant businessman has designs on using the disease for his own ends. Only Sigma can uncover the ancient McGuffin to you get the idea before ticking clock. 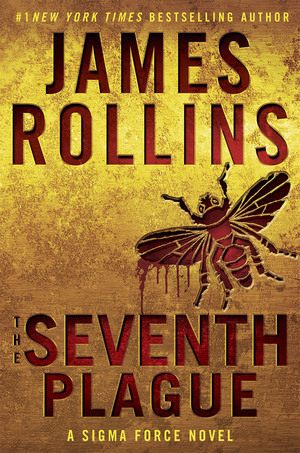 I’m going to preface this review by saying that I’m a long time fan of James Rollins’ blend of pseudo-science, mythicism, and tehcno-thriller. His Artefact McGuffin Adventures are usually very entertaining reads. Here’s the but. I don’t know if I just had a lower tolerance for the narrative this time, or if Rollins has introduced a bash the reader over the head style to his writing now. Regardless, it is annoying and hackneyed, and something I’d expect from Dan Brown, not James Rollins. It makes you notice the other problems, like the factual errors in the story. The suspension of disbelief is always high with these sorts of novels, so to have Dan Brown-ified the writing lowers my enjoyment and rating. An example of what I’m talking about was an exchange early on between the Sigma members about disease categories. We’ve just been told that this is a super deadly disease with X% death rate, and we’re then told the disease death categories, which again states this is super deadly. Okay, so us dumb readers need to be informed that this disease is really bad. But to imply that the Sigma team of science experts who deal with this sort of problem semi-regularly would have to be bashed over the head with the explanation the way they were is silly. I immediately had in mind four or five ways to write that section that weren’t out of character, repetitive, and mind-numbing to the reader. That all said, this was still a reasonably well paced thriller, with decent tension, especially into the final act. If you like Artefact McGuffin Adventures, then this is an okay instalment.